Towing heavy duty vehicles, machinery and equipment can be a challenging task, and a task it’s not wise to try and do on your own. Seeking assistance from a professional heavy duty tow company is not only recommended, it’s strongly advised. If you’re looking for assistance with heavy duty towing in Orange County, California, Towing Ravens is here to help. The differences between light duty and heavy duty towing might seem obvious but, believe it or not, there are some very distinct differences than any tow company needs to know. A heavy duty tow truck is different to operate than a standard tow truck. It requires different skills, not to mention different driving credentials. It’s not something any old tow truck driver can do. Knowing how to tow heavy duty vehicles – including truck caravans and trailers, buses, machinery, industrial vehicles and military vehicles – is an art form. It’s not simply about hooking a chain on and driving off. It takes really skill, problem solving and foresight. At Towing Ravens, we’re fortunate enough to have highly-skilled heavy duty tow truck drivers capable of towing even the most oversized loads. Towing Ravens aims to provide motorists across the city with the very best towing service possible. We pride ourselves on delivering a reliable, effective and affordable service 365 days a year. Choose our services and you will benefit with our experienced and highly-skilled towing technicians. With years of experience towing the biggest loads on the road, you’ll be in safe hands. We realize that a towing emergency can crop up at any time. That’s why we offer full 24/7 coverage throughout the city and surrounding area. 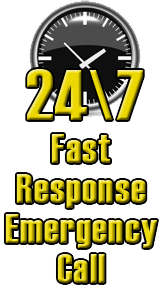 Whatever time you call us, we’ll aim to have a tow truck to you within 30 minutes. We believe in honest and fair pricing. Just because you’re in need doesn’t mean you should be taken advantage of. We offer an honest, transparent and up front pricing policy that ensures you know exactly what you’re going to pay. In addition to heavy duty towing, we also offer the following towing services in and around Orange, California. We are happy to assist – contact us today to arrange heavy duty towing, and we’ll be on our way.